One of the gravest casualties of the 10-year US-led war in Iraq is the destruction of the country’s cultural heritage, Iraqi archaeologist and architect Ihsan Fathi told RT. And all attempts to reclaim the country’s stolen treasures failed: “The Iraqi government was trying to get them back but the American Administration wanted to strike a deal and return only half of the documents,” he explained. RT:Mr. Ihsan Fethi, you witnessed the looting of Iraqi cultural treasures. Everybody knows what was happening in Iraq after the American occupation. What will be the consequences of all this for Iraq’s culture? Ihsan Fethi: As you know, our civilization originated on the territories where Iraq is now. We have historic landmarks that are over 10,000 years old. And everybody thinks that Iraq is responsible for preserving this cultural heritage. But unfortunately, Iraq is the world leader in having destruction visited on its historic sites. This destruction started during the Mongol invasion in 1258 and continued all the way to the 20th century, when the Iraqi state was formed. We’ve suffered great losses. During the 1991 occupation, the Americans reached the suburbs of Hillah. 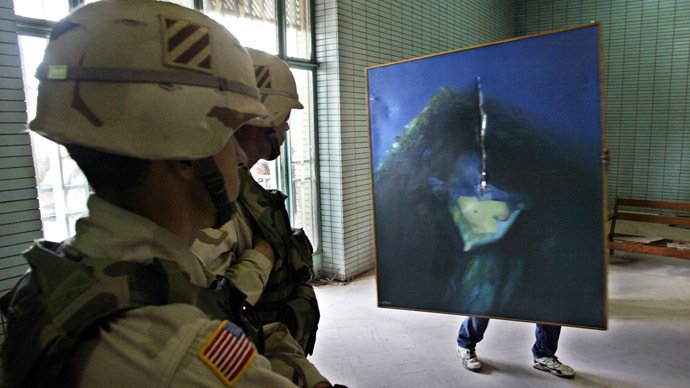 Many of the museums in the city were looted, and the US forces just let that happened. But even more damage was done in 2003, when Iraq was occupied. I will not talk about the nature of that operation right now – whether that campaign was to liberate or occupy our country. It surprises me that some intellectuals in Iraq still refuse to call this campaign an occupation. The UN Security Council resolution #1483, passed on May 22, 2003, calls the international military contingency in Iraq occupying forces. This was the official status of the international coalition. This was an occupation. Prior to the occupation a number of international organizations – including those for protection of archaeological sites which are responsible for preserving these very sites – had officially informed the USA and President Bush in particular, that as a consequence, the cultural and historical heritage of Iraq might be found in deplorable state. Among cultural advisers to President Bush there were four experts who were suggesting that the preservation of Iraqi historical and cultural landmarks should have been his priority task. RT: Still, the US allowed the looting of Iraqi historical landmarks, or maybe even gave a spur to this. Can you tell us the exact number of looted sites if there is such information at all? IF: This is a frequently asked question, too, and the answer is clear to me. People who were in charge of Iraqi museums didn’t have any detailed lists or catalogues that would enroll all cultural and historical monuments and antiquities. In particular, it refers to the National Museum of Iraq in Baghdad, which is regarded as one of the world’s largest and most important museums. The museum items should have been inspected annually, but unfortunately, the inspection was either not carried out at all, or it was not full. That is why we can’t define the exact number of stolen artifacts. However, some experts tend to think that there are about 35,000 small and large items missing from the National Museum of Iraq. RT:And they haven’t been regained, right? IF: To our regret, only a small portion has been returned. Valuable artifacts are always looted when there is a conflict and the atmosphere of chaos reigns. And international experience has proven that at best only 10 percent of them are usually regained. RT:The former regime is considered to have taken special care of rare gold artifacts and gold bars, which were of great importance. Were these items stolen, too? IF: A great number of gold artifacts and gold bars were kept in some palaces of the former president. This gold has been misappropriated. Iraqi authorities had no idea about the amount of the stolen antiquities. In addition, large amounts of currency have been also misappropriated. The country’s Central banks and other banks had accounted for billions of dollars, and now all these funds have been transferred to the USA without any paper trail. And this does not refer only to the objects of value. They have also moved out of the country tons of documents that captured the history of Iraq. These documents are priceless. All that gold is nothing compared to those historical documents that are now locked up somewhere in a US archive. The government of Iraq has attempted to return these documents home, but the Americans are trying to make a deal here and offer to return only half of the documents. The reason they are giving is that they are trying to repair the documents from the presidential palace and Iraqi special services archives, but no one knows the true story behind this. Also, a lot of documents have been moved from the Foreign Ministry and state security agencies to the US by Adnan Makiya, with the help of the occupation authorities – allegedly for the Iraq Memory Foundation. This operation had been planned long before the war. We have the information that these documents were sold to one of the American universities. Things like this should not be allowed to happen. RT:Is it true that there are some valuable Jewish manuscripts among the misappropriated documents, including one of the oldest copies of Torah, which is now said to be in Israel? IF: Yes, there are some documents in the stolen archives that belonged to Iraq’s Jewish community. Some of these centuries-old documents are now in the USA. According to international regulations, the occupation authorities have no right to move local cultural and material values. On the contrary, it is their duty to preserve these values. Iraq must insist on its right to recover all of the illegally moved objects, down to the very smallest ones. RT:So, Iraq has lost some valuable pieces of its cultural heritage under the conniving eye of the occupational authorities. But is it possible, on the other hand, that the present-day level of culture in the Iraqi society is insufficient to address the task of preserving Iraq’s historical heritage? IF: Yes, of course. I would say that we should blame not just Iraqi people, but also trade unions and other civil society organizations for not taking necessary measures in order to preserve the great Iraqi heritage. Even archeologists didn’t do anything. But interestingly, when the US occupation ended, some of Bush’s advisors resigned over the fact that the US and other countries didn’t do anything to preserve Iraqi historical sites. They were protecting objects like the Oil Ministry and others that were strategic to the US occupation forces. Even Americans themselves acknowledge that they are responsible for the destruction of many archeological sites, especially in Babylon. This city was first occupied by US forces, and later they handed it over to the Polish troops. Several thousand Polish soldiers lived there, they used heavy armor, tanks and helicopters; they were doing construction work for their military infrastructure. This seriously damaged many archeological sites in the area. Later, the US occupation authorities offered a laughable amount of money – some $20 million – for the restoration of damaged archeological objects. Several years ago at a conference in Paris, I addressed some ranking State Department officials and demanded that the US provide at least $1 billion for the restoration of Iraqi historical buildings. But the US didn’t respond to that. In many cases, Americans just allowed our museums to be looted. The National Museum was looted within three days. And Americans would not do a thing to keep the exhibits safe. That’s why Americans should take full responsibility for that.